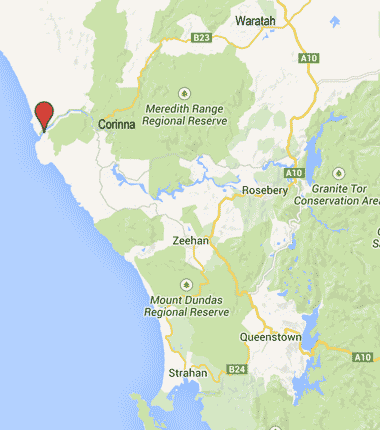 I'm referring to a tree in a small shack community near the mouth of the Pieman River on Tasmania's west coast. 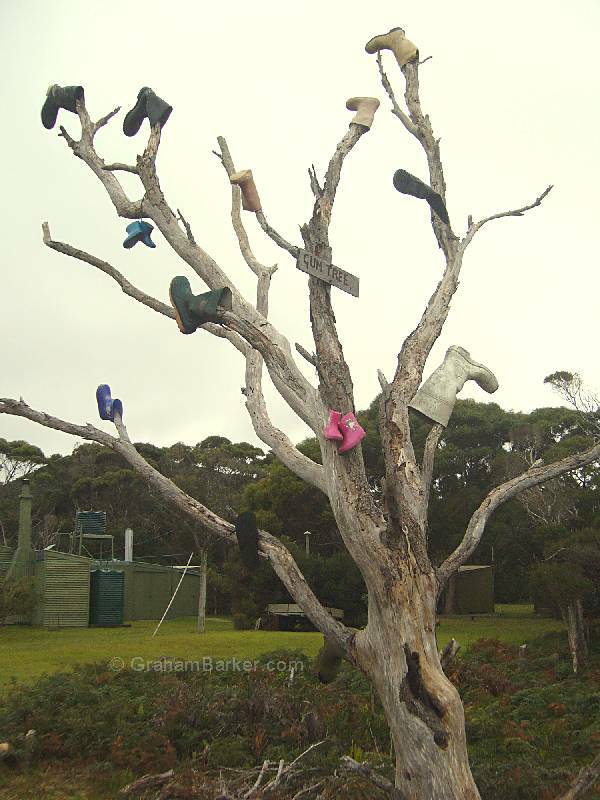 Someone mounted some old gumboots on the bare branches of the tree, and others followed until the tree had a good covering of rubber boots. In the absence of leaves, the boots almost look like a natural sort of foliage or flowers. The artwork was complete with the addition of a small hand-painted sign saying "gum tree". In most settings this would look simply odd or quirky. Here, it has the added quality of being odd while at the same time fitting in well to its environment. The Pieman River gumboot tree lives beside a small cluster of fishing shacks. Most of Tasmania's west coast is undeveloped bush or wilderness, and the Pieman River shacks sit in one of the more remote and unspoiled parts. To build a holiday home here, far from any roads, implies some toughness and independent spirit, and this shows in the distinctively individual architecture. It is a place you might go if you don't quite fit in elsewhere. 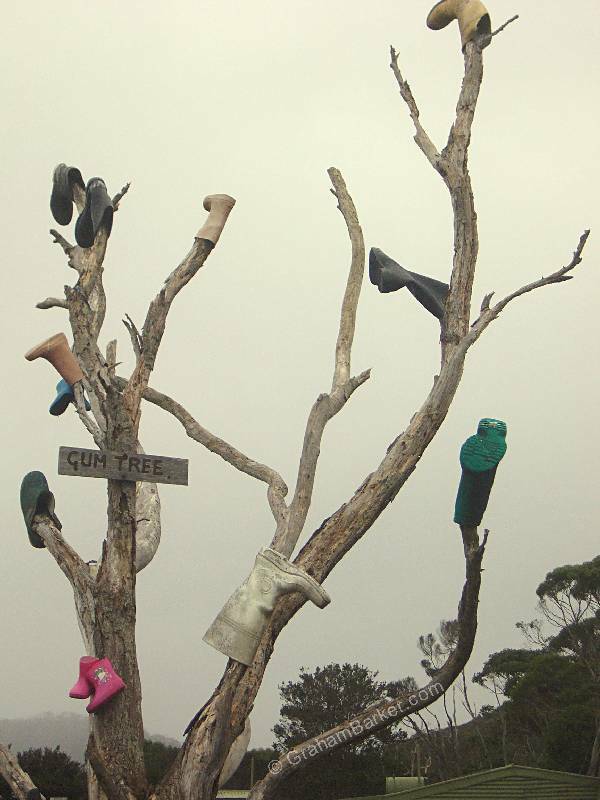 In the context of this "off the radar" community, a tree decorated with gumboots feels normal, and delightfully so. I found this tree in the way most people would - by taking the boat cruise down the Pieman River from Corinna. Upon nearing the river's mouth, the boat ties up so that passengers can walk to the sea, and the track goes right past the shacks and the "gum tree". Anyone visiting the area should treat the shack village with respect. Shack culture is especially important in Tasmania, with most shack owners having freehold title to their properties, and many living in them year round - not just weekends or holidays. Remember they are peoples' homes, not just oddities, as you walk past gazing at their creative architecture and a somewhat unusual tree.